Apart from the US and UK, Germany is a popular option for those planning to pursue their graduate studies abroad. If you have been googling about countries where you can do your MS, you would have definitely chanced upon Germany. As a thriving economy that generously invests in its education system, Germany offers a good environment for aspiring international graduate students. Affordability– The overall cost of living in Germany is less in comparison to other European countries. Also most programmes there charge very little or no tuition fees. Word famous Universities – Germany has more top-ranked Universities than any other country outside of the US and UK. Commitment to Innovation – Germany has a sound history in championing technological developments, hence the universities there offer a good research environment for graduate students. The network of universities in Germany is quite robust with over 500 universities offering 19000-degree programmes. As with the US or UK, Germany has both Public and Private Universities. As a country, Germany was divided into 16 states and each state has several Public Universities under its administration. In total there are about 400 public universities that have state assistance in funding and administration. There are also 120 private universities that are self-managed and financed. Understandably, private universities charge a higher tuition fee for their MS programmes. Technical Universities – They focus mainly on science and engineering research and offer a range of Ph.D. and Masters Degrees. [Read]: What is Germany’s Largest Technical University? Learn more about RWTH Aachen! Universities of Applied Science – They focus on practical training and have partnerships with commercial organizations. The graduate degrees in Germany are much like those in other countries. Over a period of two years, there are academic modules that are followed by a dissertation. A total of 120 credits are allocated to a graduate degree programme of which 90 credits are earned through academic courses are undertaken while 30 credits are allocated to the dissertation. What are the admission deadlines for MS in Germany? Unlike the US, German Universities intakes happen in the summer and winter sessions. Deadlines vary greatly. For example, at RWTH Aachen, the deadlines for Summer & Winter intakes for 2018 are January 15th, 2018 and July 15th, 2018 respectively. Germany offers a lot of courses that are taught in the English medium. However, most universities require you to possess a minimum of A1 Level of proficiency in German at the time of application. Also, it is always an advantage to learn the language if you wish to apply as it will not only help you adapt to your life there but also become a definite advantage when you seek internships and part-time jobs. 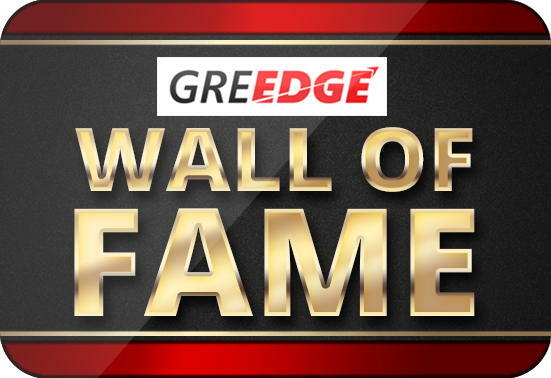 How important is my GRE Score for applications? While it is true that there are universities and courses that do not set a rigid cut-off for your GRE Score, this does not change the fact that a high GRE Score is recommended to increase your admission chances, among highly competitive profiles. It is also important to note here that universities in Germany also evaluate you based on your academic proficiency and research background. MS/Phd in Germany: Application Process made easy. Find everything you need to know in our exclusive free eBook which has universities, application process, funding and much more! Download your ebook now! 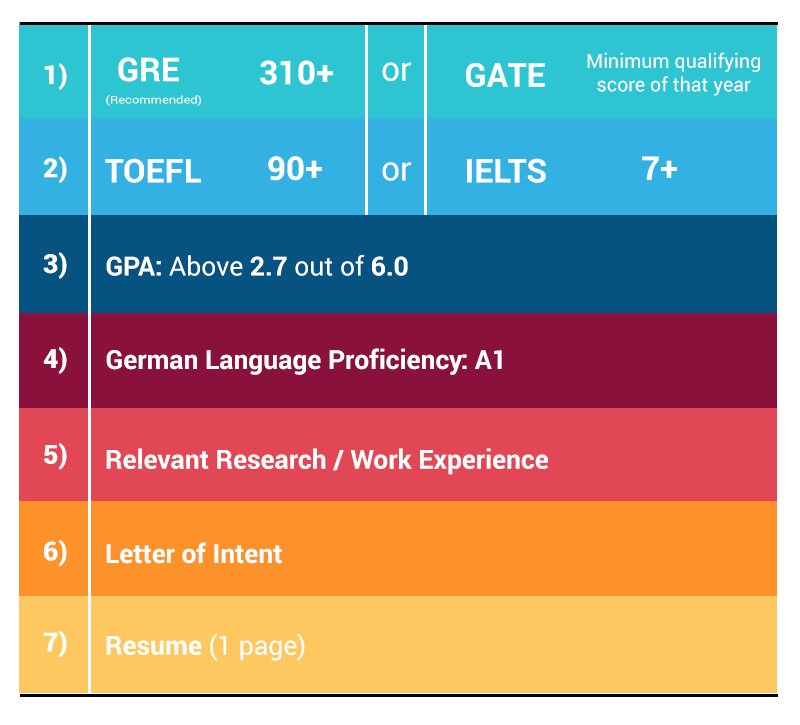 GREedge Admission Tip: If below 2.7 surprises you, then you should know that in Germany, your CGPA is calculated on a scale of 1 to 6, where 1 is the highest and 6 is lowest. To know where you stand on the scale, you can convert your CGPA using our simple formula! Germany is famed for its highly specialized courses, including courses such as Mechanical Engineering & Mechatronics, Automobile & Automotive courses, Computational Sciences and Energy Studies. Check if Germany is best suited for the specific course you’re looking for. German admissions are highly competitive. Subject matter experts with strong academic backgrounds, research or work experience are given high preference for admissions. That’s why students with a good GRE score tend to have an additional advantage over students without a GRE/GATE score. Target a 310+ score to increase your admission chances significantly. Want a strong GRE Quant score? Get to know the 5 techniques to perfect your 170/170 in GRE Quant. Find out how in our exclusive ebook. Download the Quant eBook now! Check the specific department of the university you’re interested in. Zero in on specific professors who share your research interests and who you would like to work with at the university. Some German Universities require you to get your undergraduate transcripts attested by the German Embassy. Depending on the state you studied in, the number of days required to attest your college transcripts will vary. For example, for universities in Tamilnadu, you will require at least 45 days or more to get your transcripts attested. Similar to your SOP, some German Universities require you to submit a Letter of Intent, explaining why you are passionate about the course and why you are qualified to pursue a Master’s degree. [FREE eBook Download]: Wondering how to craft a great SOP and stand out from the crowd? Based on 4500+ admits, here are our expert tips with sample SOPs to compare – Get your copy today! Take a crash course to improve your German Language proficiency. Prepare a 1-page Resume that outlines your qualifications and achievements. Check if the department of your choice requires you to apply through a centralized portal called Uni-Assist. Unlike the US, most universities do not follow a centralized portal to apply to any university or course. You must apply individually to your preferred course & university. However, some universities use a service called ‘Uni-Assist’ which is a portal that screens your application and processes it for the university to make its decision about your admission. You will be charged an application fee to process your applications. If the University or programme you opt for needs the application form to come via Uni-Assist, you can anticipate a slightly higher processing fee. Most Universities charge approximately €50 for applications. The Uni-Assist application fee is set at €75 for the first university and €15 for every subsequent application you send. Make key decisions such as the universities you’d like to apply to, the flow of your SOP etc well in advance so that you are not pressurized before the deadline. Apply to several universities across multiple locations to have a better chance of success. Choose relevant programmes rather than just popular locations to increase your admission chances. This may seem like a complex process, but hey, applying abroad for your Master’s anywhere is a tough process. With several steps to complete, important dates to remember and checklists to follow, it can be quite confusing. Comment below and let us know what you want to know regarding German Admissions and we’ll reply back to you! Here is wishing you great success in your journey to your dream university. I will be graduating next year. When should I start applying? I am interested in MS in Automobile Engineering. Thanks in advance. If you are graduating next year, the immediate admission season available to you is Winter 2018 with deadlines in July. I would advise you to start your process during the vacations now, particularly your IELTS, GRE & German Language Proficiency Tests in December to January. Hi! I am a Biotech undergrad with a GRE score of 326, with 167 in Quant and a 110 on the TOEFL. I have a cgpa of 5.94 / 10. I have had leadership roles in extracurricular activities. I now want to pursue a masters in economics. Could you suggest universities around the world and my chances of admission? Thanks! I have a gap of 3 years after my intermediate(12th) and now im about to complete my bachelors degree (b.sc)statistics, so im intrested to do Mba course in south germany. So can i apply for the admission in the german universities or colleges? Is Germany good for pharmaceutical courses? Demonstrates that a copy of an original document is a true copy , in case wherein an individual is planning to go abroad, the individual’s original documents need to be attested and to attest the same, the Ministry of External Affairs (MEA), Government of India (GOI), has given the power to various General Administrative Departments, State Home Departments, Higher Education Department or Sub-Divisional Magistrate, New Delhi, etc. Authentication of documents: All original documents/copies requiring attestation or Apostille should be first authenticated by the designated authorities of the State/Union Territory from where the document has been issued. In case of personal documents, Home/General Administration Department of the concerned State Government/Union Territory are the designated authorities. In case of educational documents, the documents should first be authenticated by the Education Department of the concerned State Government/Union Territory. Commercial Documents are to be pre-authenticated by the respective Chambers of Commerce. We can definitely help you through the admission process for Germany. Please do schedule a call with our student counselors and we’ll help you get the best admits for your profile. I am willing to apply for summer 2018. At present, I didn’t undergo ielts exam. When should I start applying? How many months required for the entire process? I am interested in MS in mechatronics. I completed my Graduation in Civil Engineering. I want to do MS in Germany .Please guide me . We can definitely help you purusue an MS in Germany. You can schedule a call with our admission counselors here who can guide you on setting a timeline and starting your admission process! Can suggest universities for me to apply for masters. I am a chemical engineer with 71% overall in my degree and also a gap year after my graduation and would like to do an MS in Germany, im not interested in Chemical Engineering.Could you suggest me some MS fields that are popular and lucrative in Germany? Hi, I am BTech graduate in ECE stream. I wish to pursue MS in Data Analytics. Will i be eligible for the programs in Germany, given i am not from the same stream? What is the after-graduation status in germany? Is it easy to get jobs there compared to US,UK and Canada? Next story MIS vs. Data Science – What’s the right choice?